I am loving this new sweater dress of mine, I found on none other than Poshmark , Banana Republic for $20. 🙂 I came across Marissa, of Marissa T Designs on Instagram, and we decided it would be great to do a collaboration together. 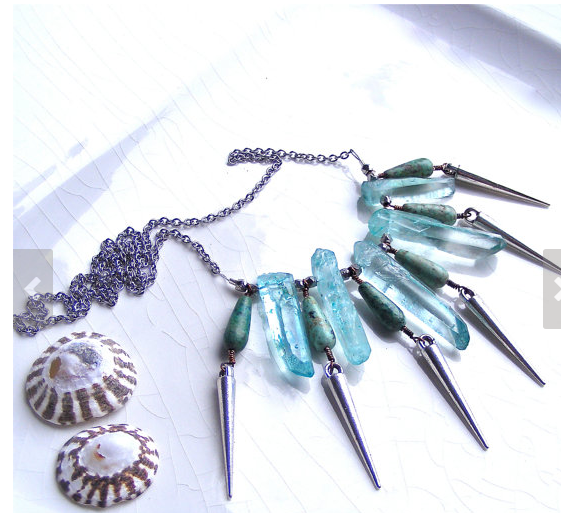 The first pieces I saw were very ocean-sea oriented with light aqua-blue almost see through crystals in varied shapes in necklaces. I also loved the smaller daintier pieces from silver chains that caught my eye. I like both styles, the larger statement necklace and layered look with tinier pieces that shine. But before I continue, let me get this out of the way. I’ve been a musician in life, and I can’t go on until I acknowledge my outfit’s color... ( an electirc guitarist’s most beloved song of all time…. NOT! ) but we do all know those first three chords! 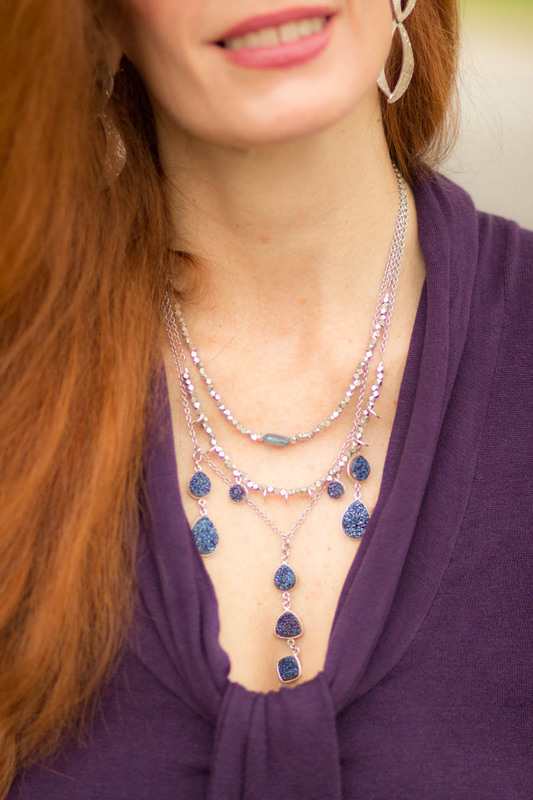 What is lovely about the necklace is that it has silver tiny beads throughout and the dark blue navy shines using druzy stones. I love that Marissa made me these special necklaces and there is such versatility, as I can wear one at a time, two, or layer all three. 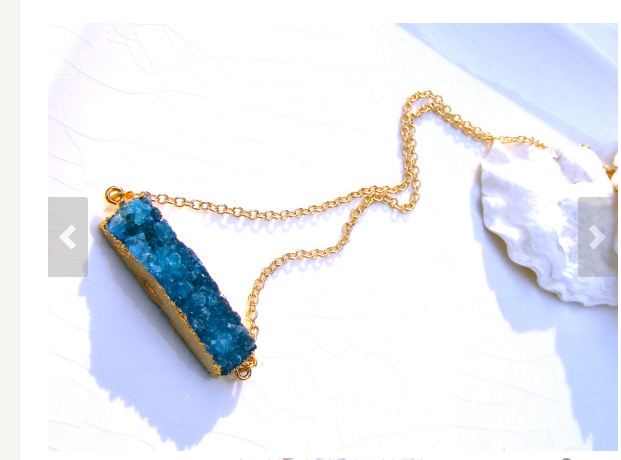 I can wear the druzy longer necklace alone if wish. Lots of variety! I have to admit, I am a bit unfamiliar with some jewelry terminology. When I asked my hubby what “druzy ” was.. we both decided to look it up as I had an idea but wasnt sure. Yes, it is what makes these stones sparkle! For all you ladies that just want to know, I am one of those that loves information! ( we won’t talk about my joy of reading medical texts) and if you are also a jewelry afficianato , here is what “druzy” is! Druzy is the glittering effect of tiny crystals over top a colorful mineral. It is beautiful when used in making jewelry. One of the perks to druzy stones is that they are not as expensive as big faceted gemstones and they have sparkle and great color and it can be cut into various shapes with ease. The druzy quartz gems grow slowly over millions of years and are found as the very last layer of growth on agate or another colorful base. It does not always refer to quartz, druzy is any kind of mineral found in a plate-like form, such asgarnets, calcite, dolomite and malachite. Common colors are white, yellow, brown, red, and orange. Druzy style beads are great for centerpieces in pendants. While they look sparkly and delicate, druzy quartz is a fairly durable gem. Marissa, of Marissa T Designs on Etsy, where you all know I love to find jewelry, particularly handmade or vintage jewelry, has a wonderful shop and I love that she designed this creation with me in mind. Check out her ETSY store HERE. In addition to my sparkly jewelry, I wanted to just say that I LOVE sweater dresses! One of the best inventions in clothing history. Basically, the process is easy. I find a color or texture I am in love with, in this case, the deep rich purple, being a jewel tone, usually works well with red heads. I liked the simplicity of the dress, as I could style it in different ways, add a belt, jacket etc. Today I kept it simple and let the jewelry take the limelight. Also, I love color and patterned tights, and these grey lace were a perfect compliment with the purple shade, my grey flannel 40s style pumps were worn soley with this look for the blog to show you how I might pair this outfit with a fall styled heel instead of boots. 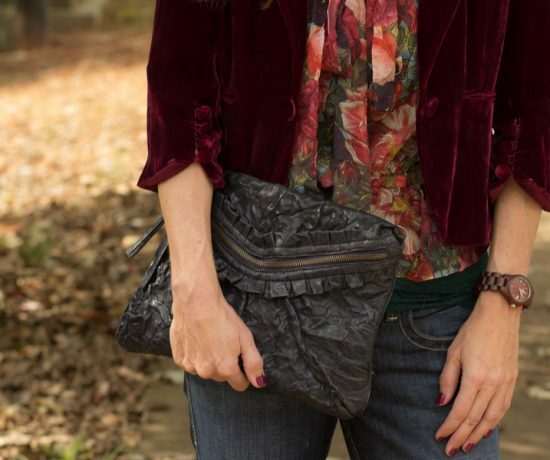 ( I can’t walk in these.. but they are for the look:-) ) and my rich plum purple Treesje satchel finished off the look. Marissa T Designs is offering a coupon code to my readers. It is 15% off any purchase in her online jewelry shop. ALSO we are having Giveaway on Instagram: with Marissa T Designs. Check it out!! “I am happy to have teamed up with Jewelry Designer, @MarissaTDesigns , (who designed these gorgeous Denim Blue Druzy & Kyanite Layering Necklaces that I’m wearing) for a fabulous jewelry giveaway! Marissa is giving away some fun jewelry surprises you will not want to miss. Love purple and this dress is adorable! Purple is a gret color on you! We’re both feeling the plums and purples today! Brilliant minds! 😉 Have a wonderful weekend Dear. Hugs to the pups! Your dress is gorgeous! I love that deep purple color and the jewelry goes beautifully with the dress. Very pretty! Thanks so much!I am a big fan of the sweater dress, you will see more on my blog , glad you like the jewelry as well. Have a great week! Such a beautiful dress (and necklace!) the necklace works so perfectly with the neckline of the dress and the colours are just lovely. You know that I am going to go a little crazy over your tights…they are the “smoke on the water” of this look. Your shoes add such a playful touch and I am loving your lippy too. Wow, that is some beautiful jewellery, and I LOVE the colour of your dress! You are right, I love a sweater dress. The purple is a wonderful color and the tights really take it up a notch. Beautiful necklace! The purple is such a pretty color on you! Those shoes are adorable too! Great dress, and what a deal! And, yes, sweater dresses are great! I had to let go of some old favorites recently and look forward to adding one or two new ones. I love the necklace! The one in the photo with the turquoise-colored stones is gorgeous, too!